I went on my second quilt retreat this past weekend with the Dallas Modern Quilt Guild. On Thursday afternoon, I drove south into middle-of-nowhere Texas to the Compass Centre, just outside a tiny town called Mount Calm. The Compass Centre was built from the ground up as a retreat facility and sleeps about 30 people. They cooked yummy meals for us and kept the iced tea flowing. 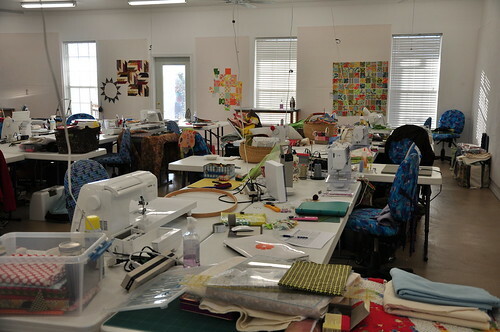 I didn't take very many photos, but here's a look at the quilting area. You can see the work of the talented ladies, Juanita of Settlers Peace and Michelle of Tapestry Tree on the design wall. There are more photos in the DMQG flickr group. This is only about a quarter of the room. 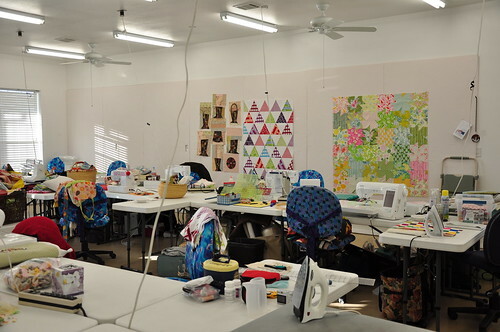 The pretty Amy Butler patchwork on the design wall to the right belongs to Lisa of Vintage Modern Quilts. and started on a new project, my first solids quilt. I worked on other projects also and left feeling like I got a lot accomplished. It was fun to catch up with friends I hadn't seen in a couple of months and make some new friends too. I cannot wait to get together with that group of creative and fun ladies again! It was a blast, girls! The picture of your solid squares quilt is beautiful! I can't wait to see this one finished. You were one busy quilter! Everything looks wonderful! That sound like a great time. I wish I could find some quilt retreats to go to. It looks like you got so much accomplished! The Good Folks top turned out nice. Not too wonky. :) Definitely looks intentional! Love the Good Folks quilt. The colors are wonderful. Your retreat sounds like heaven too. I haven't been able to find one around me yet, but I'll keep looking. Your Fresh Cut string quilt is so cool. And quilting retreats are the best! It was great to catch up with you too, Melanie. 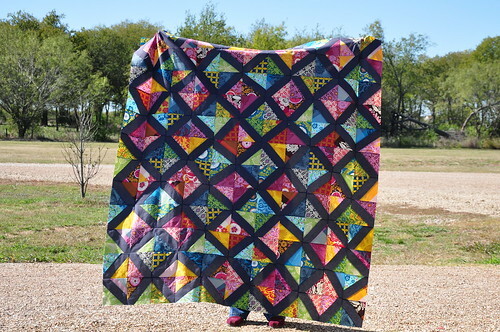 I am loving the way your "solids" quilt is coming together. I can't wait to see how it looks quilted. oooh, lots of inspiration! We need to have a retreat here. Sounds wonderful! I would love a retreat like that. 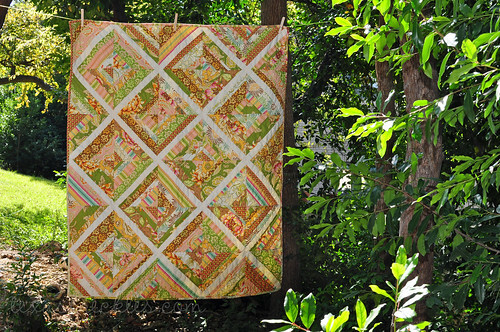 I really like how the Freshcut String Quilt turned out...beautiful! Thanks for sharing your experience of the DMQG retreat. I loved seeing the projects you're working on. I especially like the solids quilt you're working on. The way you photographed makes it look like stained glass. Keep up the good work. Hi Melanie, My name is Nadine and I'm in the process of creating a website for my kids book company. I'm writing because I LOVE your cheater quilt on Spoonflower and I was hoping you'd give me permission to have it as a backdrop on the website? You will of course be given written recognition for the design. Thanks Melanie, hope you have a nice day. Hi Melanie. The Compass Center is a great place to go retreating. Looks like you did a lot of sewing and I know from experience that you are full of stories and wonderful food from Melissa. Take care. We're scheduled from the April 2011 time slot. I am so happy I found this blog. I am a beginner quilter and I love hexagon, it is so relaxing. Your video and tips are so clear. I am doing a pincushion from the Blackbird Designers, from the Country Inn book. I am also happy because from grandchildren live near Dallas in Euless. I will have to ask you what quilt shops I can go when I visit. 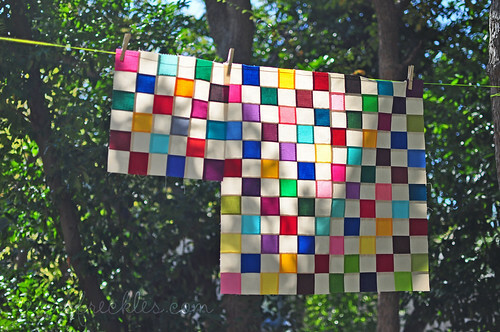 Love the freshcut strings quilt! I hape a pile that I have yet to figure out the perfect use for and this is inspiring! I'm hooked on solids... they are so interesting once you give them a chance. Can't wait to see this quilt come together!